This is part 6 of our instructional series of how to assemble a racing drone. 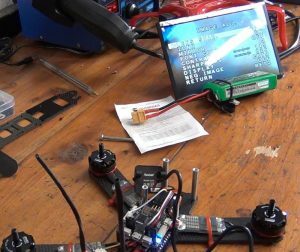 In this series, we are building a Lisam 210 frame and in this article, we show you how to install the FPV camera and video transmitter so that you can fly your drone through your goggles. Check out the introduction post for more information about the series. 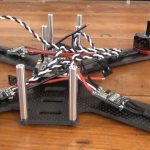 Previous article: How to build a drone racer: Part 4 – Electronics and Part 5 – Finalizing the Build. 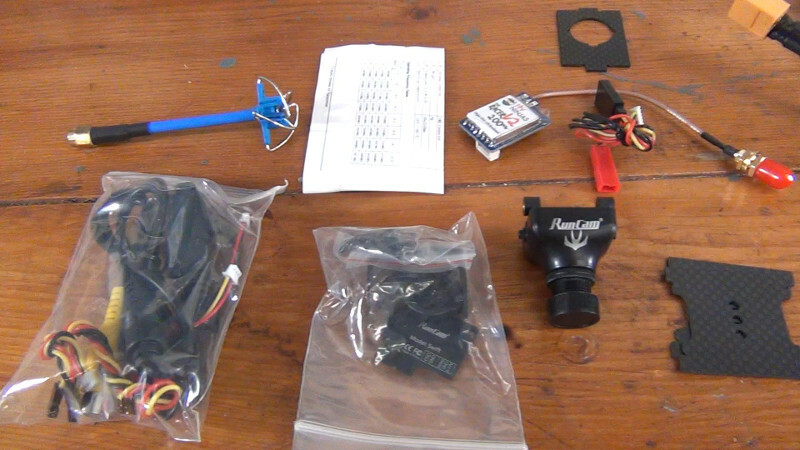 When should you buy / install your FPV gear? While you almost certainly want to eventually add your FPV equipment to your miniquad, you may want to hold off on it for starters. If you are new to the hobby, we recommend learning how to hover and fly basic maneuvers in third person before donning your goggles. If you are following our advice then adding your FPV equipment right now is just adding liability to your build. Every crash you make will have two more pieces of electronic equipment to potentially break. Similarly, if you are building on a budget, you can purchase a quadcopter and radio gear for under $250 pretty easily. The FPV equipment, including goggles, will cost you an additional $150 at least. Skipping the FPV step – at least for awhile – is a great way to get flying faster. Whatever your reason, you can add the FPV equipment to any build at any time without wasting much time at all. 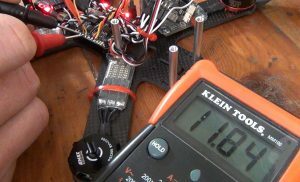 Therefore, if your goal is to get your quadcopter flying, we recommend you skip this build step and go on to part 6 instead, and revisit this when you are ready to fly first person. 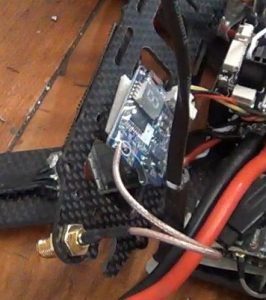 Any mounting gear from your quadcopter frame kit for the FPV camera. Both the Video Transmitter (or “VTX”) and FPV Camera will come boxed with all sorts of gear. Some of it you will need, some of it you can throw away. We’ll walk you through that in this guide. Most video transmitters will have either one or two connectors. Either way, most will have 5 or 7 wires coming out of them in total. As you likely suspect, the red and black wires are positive and negative power lines. The trick to video transmitters is that one set of the red/black wires is a voltage regulator output which is meant to be used to power the FPV camera. 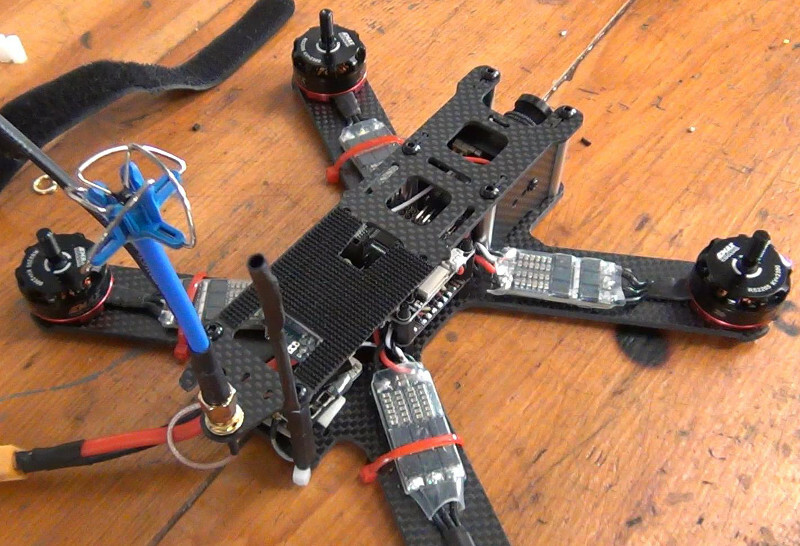 The other set of red/black wires is a voltage input which needs to be fed from the flight battery or your PDB. You must ensure that you only hook up the voltage output wires to your camera or clip them off and not use them at all. Hooking these wires up to power the video transmitter can cause the internal voltage regulator to fail or can blow your VTX up because of overvoltage. The yellow wire is an analog video input signal wire that needs to be connected to the FPV camera. Some video transmitters can also transmit stereo audio. These transmitters will have audio wires which don’t have a standard color. 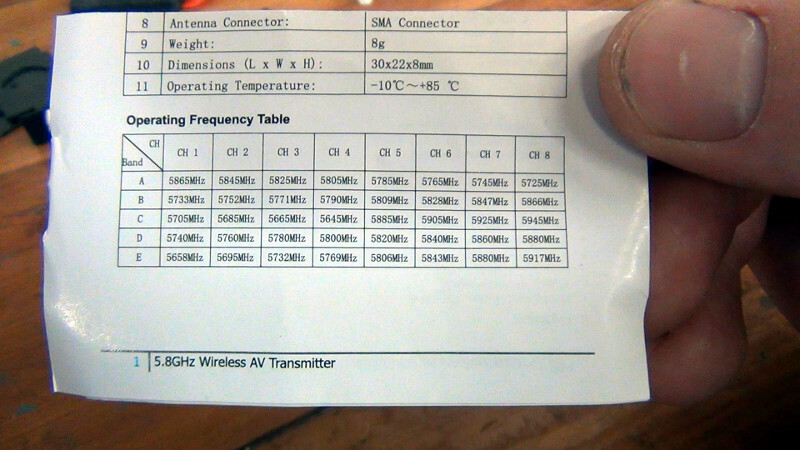 Consult your video transmitter manual to figure these out. These signals are identical to the signals you would insert into the RCA jacks in the back of some old televisions (in fact, you can do this to test the video feed of your camera!). 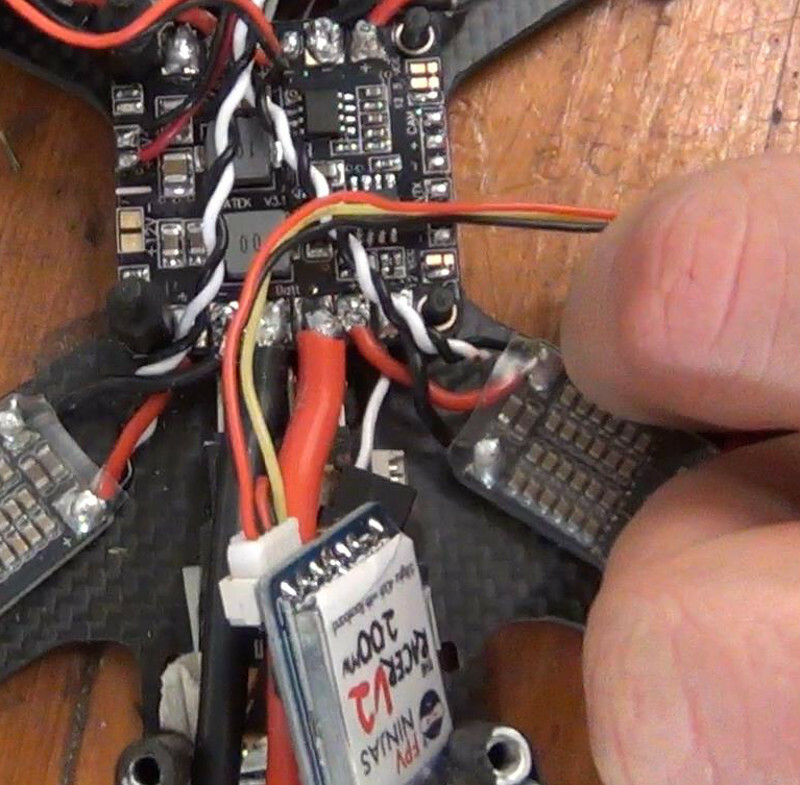 FPV cameras can also have one or two connectors on their backplate. 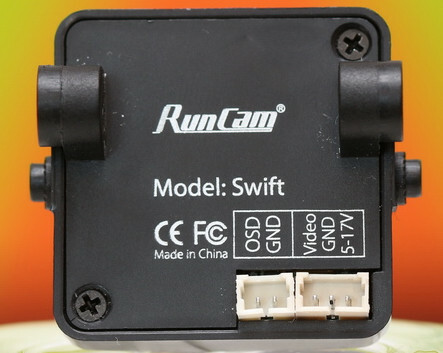 Runcam cameras generally have 2 – one for the OSD controller (2 wires) and another for power and video input (3 wires). Foxeer cameras generally only have 1 connector which has 4 wires – the fourth wire is for the OSD controller and is not used when connecting the camera to your VTX. Of these two designs, we prefer the Runcam design – it allows you to easily hook up an OSD controller at the field for simple programming of your camera. Foxeer cameras must be wired and powered separately from your quadcopter for programming since they only have a single connector. 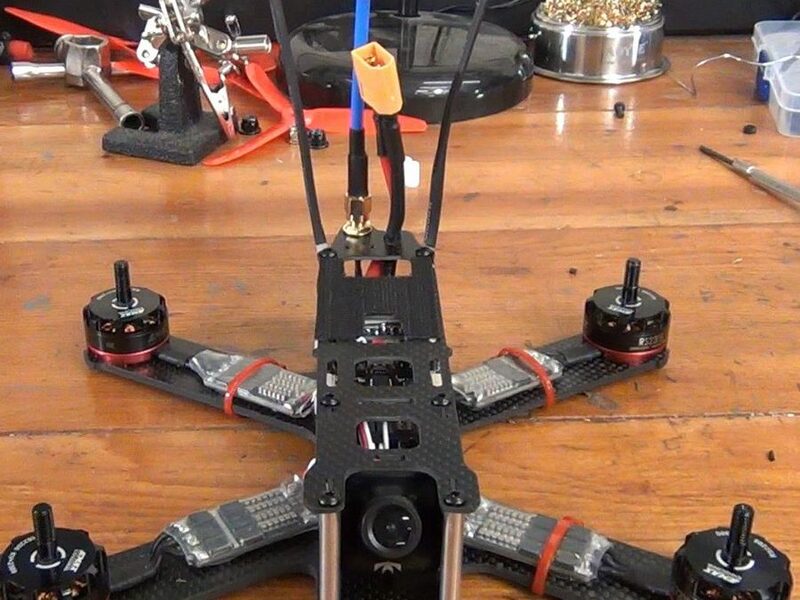 When installing the camera into your quadcopter, you will only be using 3 of the wires from your FPV camera, regardless of camera make and connector count. These 3 wires will be the power and ground wires (red and black) and video output wire (yellow). All other wires can be ignored. The first step of installing your FPV electronics will be hooking them up to your PDB to provide electrical power. 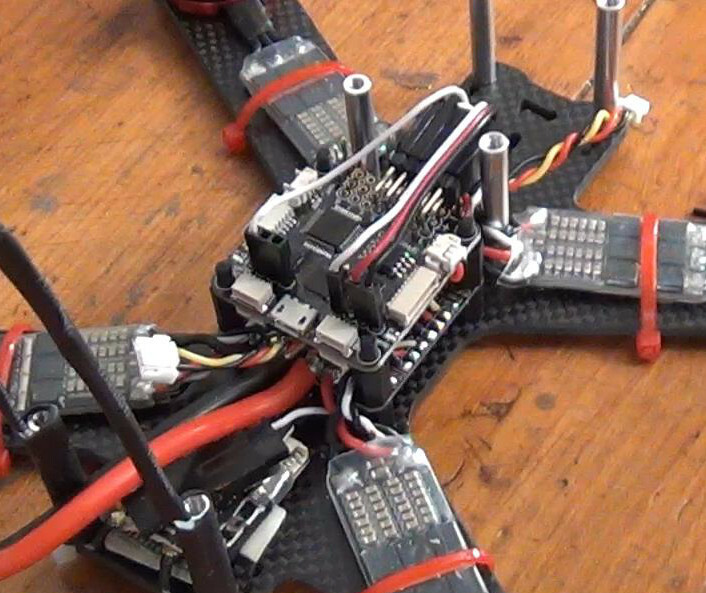 To do this, you’ll need to disassemble your quad down to your PDB. Once you’ve done that, you’ll need to figure out how, exactly, you will provide power to the VTX and camera. 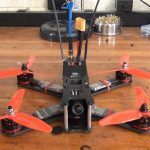 (Recommended) VTX and Camera hooked up to PDB. If your PDB provides a regulated 12V power output, you should use it for your video transmitter. Some PDBs will also have 5V pads to solder FPV cameras to as well. This is the way we recommend you wire your electronics if your PDB supports it. VTX hooked up to PDB and Camera hooked up to VTX. Most video transmitters provide a 5V voltage output for cameras. If your PDB only provides a 12V output for your VTX, hooking up your camera to the voltage output of your VTX is a good way to get 5V to it. VTX and Camera hooked directly to battery voltage. This is risky because some poor quality or damaged ESCs can cause voltage spikes which will destroy one or both of the VTX and camera. You must also make sure your VTX and Camera can withstand battery voltage (at least 17V for miniquads). VTX hooked directly to battery voltage and Camera hooked to VTX. This is convenient because there are several cameras on the market that must be run on 5V and cannot be hooked directly to the battery. This would be the preferred setup in this case (if you don’t have a PDB). Again – consult the manual for your FPV camera and VTX to double and triple check the allowable input voltages and verify that those voltages are what you are supplying with the method of installation that you pick. For our Lisam 210 build we will be using a Matek PDB which provides easy to use soldering pads to hook both our VTX and FPV camera to. Therefore, we will be taking the recommended route (1). First, we need to configure our PDB. The first step is to tin the soldering pads for the VTX and the Camera. This is what the PDB looks like when the VTX and camera wires are ready to be installed. For this build, we selected 12V to both the VTX and Camera. Again – many cameras will only accept 5V. Make sure you read your manual before you decide what voltage to use! Next up, lets get the wiring situation figured out. 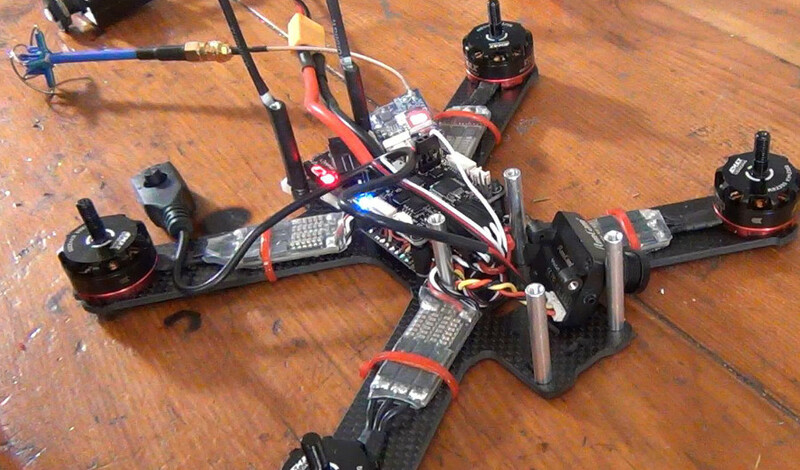 Hook up the power input, ground and video wires to your VTX and camera. Figure out where you want to place your FPV camera and VTX and run the wires through your quad so they reach the place where you will be soldering them down to. 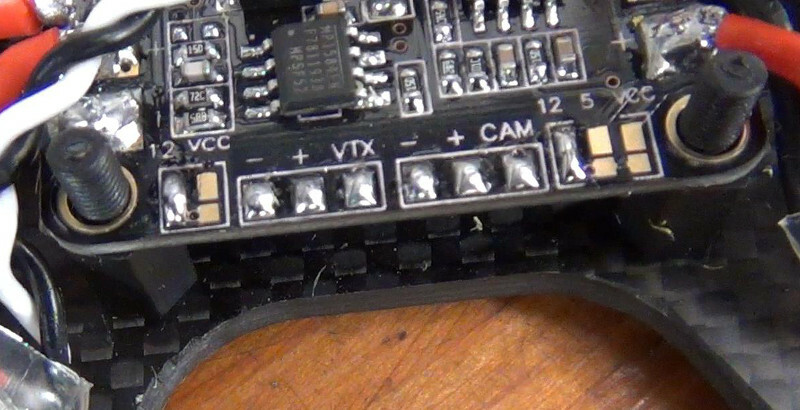 Our Matek PDB has a neat feature that automatically connects the analog video feed from the camera to the VTX by simply soldering the yellow wires from each component directly to a pad on the PDB. If your PDB does not have this, you will need to directly connect the video output wire from the camera to the video input wire on the VTX using a splice. Since our wires will just be running to the PDB, we will trim them to a length convenient for this application. When trimming the wires, make sure to leave about a half inch or more of “wiggle room”. Remember that you will want to tilt the camera up and down so you will need this extra slack. Measure twice before you cut. There is nothing worse than cutting wires too short and not being able to place your components where you want them to go. These connectors are almost always proprietary and hard to replace. If you screw up your build will be delayed for at least a few days while you wait for replacements. Next up, it’s time to make the connections. 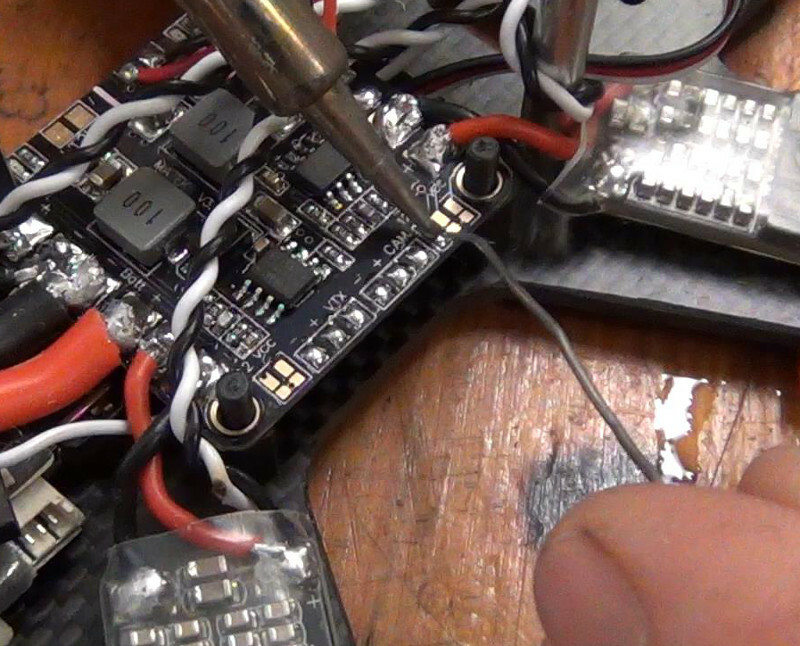 We prefer to hard solder the VTX and Camera wires to the PDB where possible. The reason is using pins will often result in unacceptably large gaps between the PDB and the flight controller. Such a gap will not fit in most compact modern miniquad frames – certainly not in our Lisam 210! When soldering these wires, clip only a very tiny amount of insulation off. You do not want loose, unprotected wiring to move around the PDB area causing shorts between battery voltage pads or power electronics. 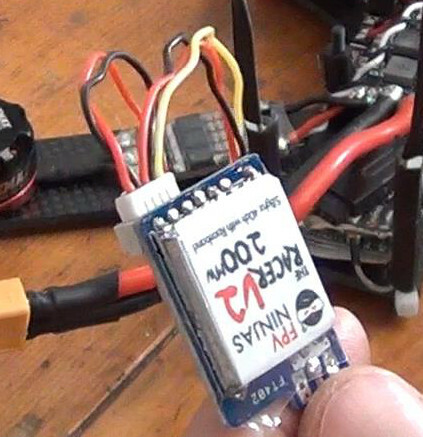 Finally, once you’ve finished your soldering job, we recommend you power up your quad (using a smoke stopper!) and check the voltage coming out of both your VTX and Camera connectors. Make sure one last time that the voltage is acceptable for the component you are using! 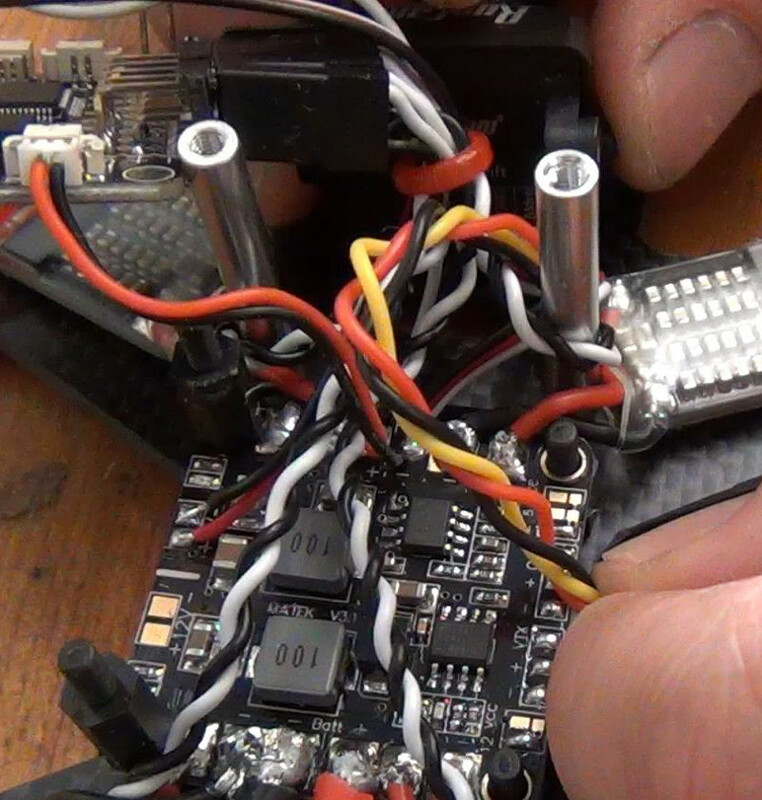 Once the wiring is complete you can reinstall your flight controller on top of your PDB. 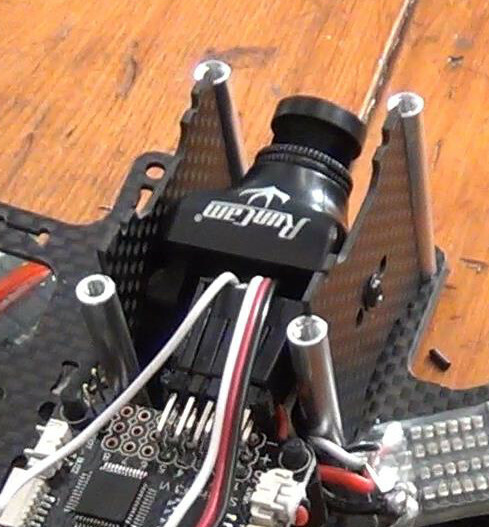 Route the VTX and Camera wires to the locations where these components will be located on your frame. With all the electrical connections made, it is time to make sure the system works. You’ll do this by plugging in your VTX and powering the camera. But not before attaching your VTX antenna. Let me repeat that: NEVER POWER UP YOUR VIDEO TRANSMITTER UNLESS AN ANTENNA IS ATTACHED TO IT. 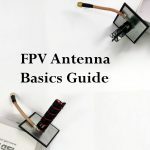 If you fail to put an antenna on your VTX while powered on, it can quickly overheat and lost most or all of it’s transmitting power. Now, power up your FPV goggles or a 5.8GHz monitor and tune to the appropriate channel for whatever you picked on your VTX. Hopefully you are seeing an image! If not, break out the multimeter and start probing. Make sure the video feed makes it from the VTX to the camera and that both components are getting power. Once you’ve got a video feed, it would be a good time to go ahead and set up your camera. We won’t walk you through how to do this in this guide, but we recommend you check out this video for some tips. As Mr Steele explains, setting up your camera is very important as you want very high dynamic range on your FPV video feed so that you can easily make out branches and twigs when flying low and fast. 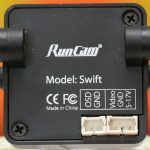 A quick note: if you are using a RunCam camera, you can do this programming by simply hooking up your OSD controller (as seen in the image above). You can then do your programming using the wireless video feed to your goggles or 5.8GHz video monitor. If you are using an HS1177, however, you’ll need to remove the camera from the quadcopter and program it separately using an external battery and monitor/TV with an analog video input. If you are feeling really ambitious, you can make a cable so that your HS1177 works like a RunCam. Click here for a video demonstration on how to do this. The last step of the FPV installation is to attach your VTX and camera to your frame. We’ll break this down by component. There are many different form factors for video transmitters, so it is hard to make a suggestion that will work for all of them. We will give you some tips, though: We like using double sided tape to mount the video transmitters on the underside of the top plate of the frame. You can also use velcro or zip ties to secure the VTX. One thing to note is that video transmitters get hot. We have noticed that they will melt through some adhesives and glues so be wary of that. 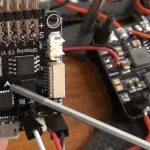 You really don’t want your VTX to go through the props – having two redundant methods to secure the VTX is not a bad idea. The leftmost plate in this picture will not be used since it locks the camera in at a ~15 degree angle. You do not need to use it because you can get your tilt angle “locked in” good enough just using the screws provided with the Runcam Swift. To mount the camera, place the other two plates on each side of the camera and screw the plates to the camera using one of the holes in the plates. The different holes are offered to give you the option of moving the camera forwards or backwards depending on how long the lens is and what is mounted behind the camera. For our build, we found the middle hole worked best. With the camera sandwiched between the plates, simply push it into the slots in the frame and you are good to go. Tighten the two screws that holds the camera to the plates to control the tilt tension. Make sure to run the tilt up and down to make sure the camera is not rubbing on anything or getting blocked. With the camera and VTX wired and mounted, you are good to go fly some FPV. The last part of this series will discuss some of the final build steps required to clean up your quadcopter so that it will be ready for flight (and look like the completed quad pictured above). Stay tuned!